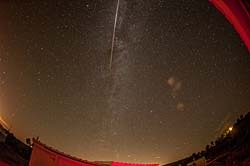 Catching a meteor on film is an interesting and challenging specialty of astrophotography. Although at a dark location we may see several meteors flash by even when a meteor shower is not in progress, most of these are so dim that they are a challenge to record. Even when a shower occurs, a rate of one a minute is considered a healthy shower. 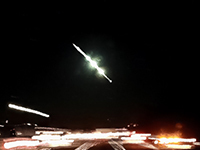 Meteor storms (up to several meteors per second) are once-in-a-lifetime viewing events, especially if they are not predicted ahead of time. Adding to the photographic challenge is the fact that most ordinary camera lenses cover a relatively small part of the sky. Special wide angle lenses can cover more of the sky, but typically they reduce the sensitivity of the camera system and/or cost much more than normal lenses. Throw in a bright moon and things really get difficult. Nevertheless, one can still be lucky! This meteor shower deserves special mention as it has historically put on a good show every 33 years or so. 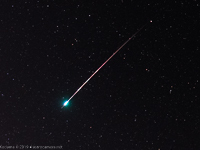 As in the case of many regular meteor showers, it is associated with a short period comet. Each year the earth passes near the orbit of the comet and its debris, but in addition, about every 33 years, the comet main body and denser debris cloud is in our vicinity, making an exceptional meteor shower a possibility. This was the case for the 1998-2002 period.